Los Angeles, CA – Rob Rhinehart, developer of the “magical milkshake” known as Soylent, has been criminally charged for attempting to build an off-grid “experiment in sustainable living” without obtaining city permits. He could face up to two years in prison and a $4,000 fine. 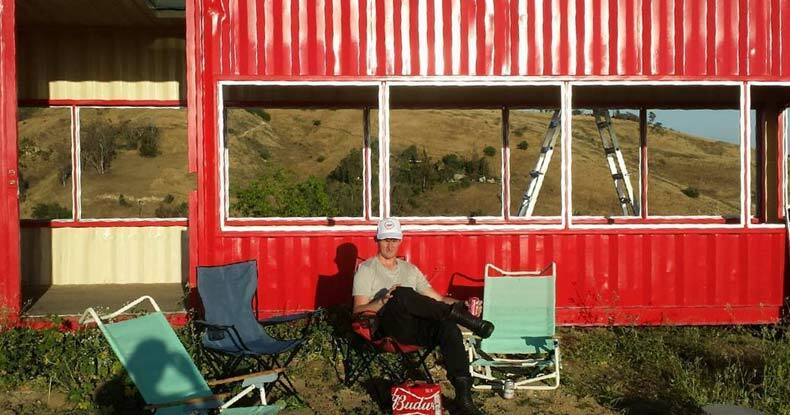 Rhinehart bought an 8,422-square foot plot of land on Flat Top Hill overlooking the city and placed a shipping container on it, planning to create a minimalist dwelling with solar panels, septic tank and graywater recycling. However, any time someone wants to live detached from the government-regulated grid and associated extortion fees, it draws the attention of authorities. Part of the problem may be that he didn’t move quickly enough for nearby residents who complained about the large red structure sitting up on the hill. They didn’t like that some trash was left behind after Rhinehart hosted a party there, and how the shipping container became the target of graffiti and misbehaving youngsters. Rhinehart said he would move the structure to a new location, but the city was already working to bring him up on charges. Rhinehart maintains that he spent thousands to improve the land, remove trash and mow the grass on his land and the entire hilltop. Nearby residents have long called for the area to be turned into a park, but the city wanted to make a buck from it, so they auctioned it in December, allowing Rhinehart to purchase the land. Now, after residents complained, and with no indication Rhinehart intends to connect to the city grid, Los Angeles has deemed the shipping container an “unlawful structure” and removed it. Concerning the residents who complained about the structure, the 27-year-old CEO offered an apology on his blog. “I would like to offer my sincerest apologies to my neighbors who I upset. Rhinehart plans to reinstall the structure or “a new iteration” of his design and build a fence for security and privacy. He also intends to get the necessary permits from Los Angeles, assuming they let him go forward with the off-grid experiment. But first he has to show up in court on September 7 for arraignment to fight overzealous authorities, who were glad to take his money for purchasing the land but are now displeased that his structure is unpermitted. Many other cities have approved shipping container projects, as Rhinehart points out. His experiment at Flat Top Hill will tell us whether Los Angeles is on board with the trend toward sustainable living, or thwarts the attempt at living free from the clutches of the government-regulated grid.